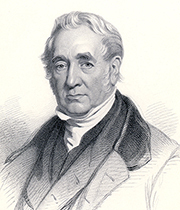 George Stephenson had been constructing steam locomotives and colliery railways for some time, so by the 1820s he was an experienced mechanical engineer, an achievement he attained through application of his observations and ideas. He was now ready to take charge of the first large-scale railway project commissioned in Britain, the Stockton & Darlington Railway (25 miles or 40km, constructed 1822-5) — the first permanent steam-powered public railway in the world. The coalfields in the north of England all shared the same challenge: transport. Coal, minerals and other goods needed to be moved as cheaply and efficiently as possible. A packhorse route had developed between the coalfields of County Durham to the River Tees at Stockton, where onward shipment was possible by sea. Between 1767 and 1815, various proposals were made for the construction of a canal connecting the Shildon area to Stockton via Darlington, including a scheme by John Rennie (1761-1821). Welsh engineer George Overton (1774-1827) proposed a horse-drawn tramway, and surveyed a route. Indeed, a tramway route would receive Parliamentary approval before Stephenson's involvement. The tramway project was backed by a powerful group of Quaker (Society of Friends) businessmen, whose investment accounted for some two-thirds of the shares sold. Key figures included Thomas Meynell (1763-1854), Edward Pease (1767-1858), Benjamin Flounders (c1768-1846), William Chaytor junior (1771-1847), Thomas Richardson (1771-1853), Leonard Raisbeck (c1773-1845) and Jonathan Backhouse (1779-1842), along with the Gurney family of Norwich. Rather than rely on private agreements with the landowners whose properties the tramway would cross, a private Parliamentary Bill was drawn up to sanction the scheme. However, on 5th April 1819, it was defeated by 13 votes — many of the landowners were Members of Parliament. Overton modified and resurveyed the route and a new Bill was submitted, receiving royal assent on 19th April 1821. It was entitled An Act for making and maintaining a Railway or Tramroad from the River Tees at Stockton, to Witton Park Colliery, with several Branches therefrom, all in the County of Durham. Coincidentally, 19th April 1821 was also the day that Stephenson and Nicholas Wood (1795-1865) travelled from Killingworth Colliery to meet Pease in Darlington. Pease wanted Stephenson's advice on Overton's proposal. Wood, recalling the epic journey, wrote, "... we rode on horseback from Killingworth to Newcastle, a distance of five miles [8km], travelled from thence by coach, thirty-two miles [51.5km], to Stockton, then walked along the proposed line of railway, twelve miles [19.3km], from Stockton to Darlington. We had then the interview with Mr. Pease, by appointment, and afterwards walked eighteen long miles [29km] to Durham". Stephenson and Pease met again on 22nd May, followed by an inspection of the route. By the end of July, it had been decided to use edge rails, rather than plateway. Between 14th and 31st October 1821, Stephenson resurveyed Overton's line, assisted by his son Robert Stephenson (1803-59) and by John Dixon (c1795-1865). Robert, then 18 years old, had been released from his apprenticeship to Wood (and the dangers of working in a colliery) to work with his father. 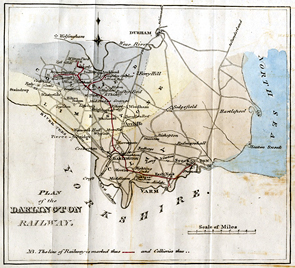 Stephenson submitted the survey report and an estimate, plus proposals for a better route, to the railway company on 18th January 1822. His new route was designed to maximise the possibility of using locomotives instead of horses. It featured gentler gradients and wider curves than Overton's line. It also optimised cut and fill operations, and was estimated to be 6.4km shorter and more than 20% cheaper than Overton's, though in places it did overstep the land corridor permitted under the Act. 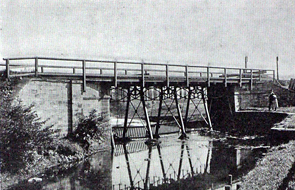 The new plan was accepted four days later, and Stephenson was appointed engineer on the understanding that he would spend at least a week per month on the project. His annual salary is variously quoted as £300, or £600-£660 including expenses and salaries for his assistants, the resident engineers Dixon and Thomas Storey (1789-1859). On his advice, contracts for the line were tendered based on short lengths of less than 2km. The resident engineers then had to impose control on a headstrong collection of local sub-contractors carrying out piecemeal work with varying degrees of ability. While a variation Act was prepared, construction commenced on the sections of line where no change to the land corridor was needed. Apart from the earthworks, the biggest project cost was the rails. Amid heated debate, Stephenson recommended using malleable iron rails for their strength, their lighter weight and because they required fewer joints than the cheaper cast iron ones, despite the fact that he held a patent with William Losh (1770-1861) for cast iron rails. An embittered Losh falsely accused him of colluding with Michael Longridge (1785-1858) of Bedlington Ironworks, where John Birkinshaw (c1781-c1845) was pioneering rolled wrought iron rails. Both types were used in the end, though most were of malleable iron. On 23rd May 1822, Stockton & Darlington Railway Company chairman Meynell laid the first rails of the single track near St John's Well in Stockton on Tees. They were of malleable iron, each 4.6m long and weighing 12.7kg, and set apart by a distance that would became known as 'standard gauge' (4ft 8.5ins or 1.435m). Exactly a year later, the passing of An Act to enable the Stockton and Darlington Railway Company to vary and alter the Line of their Railway, and also the Line or Lines of some of the Branches therefrom, and to make an additional Branch therefrom, and for altering and enlarging the Powers of the Act passed for making and maintaining the said Railway enabled the construction of the sections outside the original land corridor. An additional clause permitted locomotive working. The challenge of sourcing the considerable quantities of rails required was met by the founding of Robert Stephenson & Company to manufacture railway equipment and locomotives. Its five partners were George Stephenson and son Robert, with Pease, Richardson and Longridge. Robert became managing partner. The company was set up on 23rd June 1823, at Forth Street, Newcastle. Works manager Timothy Hackworth (1786-1850) was appointed at a later date. The works were operational from August that year, and in November the company received its first order from the Stockton & Darlington Railway, to construct four stationary engines. The engines pulled trains up the rope-worked inclines at the western end of the line — at Etherley south of Witton Park Colliery and at Brusselton south west of Shildon — where the slopes were too steep for horses or the locomotives of the day. Also during that year, Stephenson and family moved from the West Moor cottage to a new townhouse on Eldon Street in Newcastle, to be closer to the Forth Street works. May 1824 was particularly busy for Stephenson. On the 17th, the Haggerleazes branch of the Stockton & Darlington was sanctioned by an Act of Parliament. Where the Stockton & Darlington led, others followed and a few days later on the 20th, promoters agreed to form a company to back the Liverpool & Manchester Railway. Stephenson was appointed engineer and asked to undertake surveys for a submission to Parliament in 1825. This project would reinforce the pre-eminence in the emerging railway industry of both George and Robert Stephenson. A happy event rounded out the month. On the 27th, Eleanor Stephenson (1784-1847), Robert's beloved Aunt Nelly, married Stephen Liddle (1794-1839) at St John's church on Westgate Street, Newcastle. Her new husband worked at Robert Stephenson & Co. But Robert, perhaps frustrated at being in his father's shadow, was determined to make a name for himself. He hankered for adventure, and he became interested in the Colombian Mining Association's proposal to re-open the silver mines of Santa Ana in the Mariquita district of Tolima, Colombia, some 190km east of the capital Bogota. His partners at Forth Street relinquished him reluctantly, thinking he would be away for a year. In fact, he signed a three-year contract and on 18th June 1824 departed from Liverpool aboard the Sir William Congreve with his expedition companions and more than a tonne of luggage and equipment. They arrived at La Guayra in Venezuela on 23rd July. Additional mining machinery was shipped separately from Falmouth. Back in Britain, railway schemes were proliferating. As Longridge wrote to Robert on 17th August, "I have little hesitation in saying that the mode of conveyance upon Rail Roads by Steam will soon become National". On 16th September, the Forth Street works received orders for the first two locomotives for the Stockton & Darlington Railway — Locomotion (No.1) and Hope (No.2) at about £550 each. 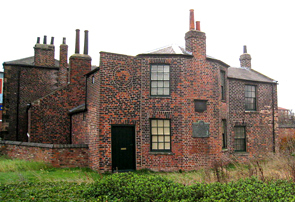 On 30th or 31st December 1824, to deal with the flood of incoming work, Stephenson established George Stephenson & Son, "an office for [civil] engineering and railway surveying", with the same partners as Robert Stephenson & Co. His assistant engineers included Dixon, Storey, Joseph Locke (1805-60) and Thomas Longridge Gooch (1808-82). However, at times the company would delegate too much work to inexperienced and underpaid men. Construction continued on the Stockton & Darlington Railway, which opened with much ceremony on 27th September 1825. Stephenson himself drove Locomotion, with its tender, a string of wagons and the company's first passenger coach, Experiment. The train was crammed with about 600 people (at least twice as many as had tickets) as well as freight. Locomotion pulled a load of more than 80 tonnes at speeds of up to 38.6kph (24mph), taking around two hours to complete the first half of the journey. The new railway's coat of arms, showing a horse-drawn train of wagons, was surrounded by its motto Periculum Privatum Utilitas Publica ('At Private Risk for Public Service'). Initially, the line operated like a highway, used by any company with a lease and a train, whether horse powered or steam propelled. A few days after the opening, two more steam locomotives were ordered from the Stephenson manufactory — Black Diamond (No.3) and Diligence (No.4), costing £600 each. Hope was delivered in October or November 1825, Black Diamond on 17th April 1826 and Diligence on 18th May 1826. They were only a little more sophisticated than Stephenson's earliest engines, and suffered some poor workmanship in Robert's absence. The Stockton & Darlington proved its worth and was soon extended, with a branch at Black Boy in 1827. In 1828, the company gained further powers under An Act to enable the Company of Proprietors of the Stockton and Darlington Railway to make a Branch therefrom in the Counties of Durham and York; and to amend and enlarge the Powers and Provisions of the several Acts relating thereto. Branch lines were added at Croft (1829) and Haggerleazes (1830), with an extension to Middlesbrough (1830). In 1831, the railway's single line with passing places was replaced by double tracks, and timetables and signalling were introduced. By 1833, the Stockton & Darlington Railway was completely powered by steam. Stephenson's name was now forever linked with the birth of the railways as we know them. 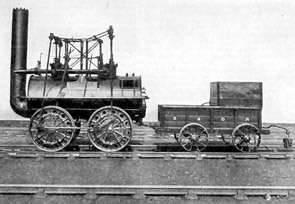 Stephenson's Locomotion No.1 (originally named Active) and her coal tender, Experiment. She was the first and only engine on Stockton & Darlington Railway when it opened, and she was the first steam locomotive to pull a passenger train on a public railway. You can see her at the Darlington Railway Centre & Museum. Proposed route, Stockton & Darlington Railway. The final route of the Stockton & Darlington Railway (black lines) mapped alongside the modern lines in the area (red lines). 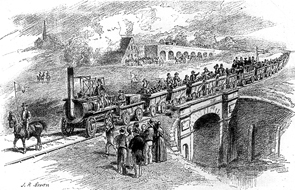 Opening of the Stockton & Darlington Railway, showing Locomotion No.1 crossing Skerne Bridge (1825, architect: Ignatius Bonomi, world's oldest railway bridge still in constant use) just outside Darlington. Note the horse walking in front of the train. One of the earliest iron railway bridges, Stephenson's Gaunless Bridge (1825) was used by horse-drawn wagon trains on the branch line of the Stockton & Darlington Railway between the Brusselton and Etherley inclines. Its abutments can still be seen in West Aukland but the bridge has been re-erected at York Railway Museum. The world's first passenger train ticket was sold in this Grade II* listed building, at 48 Bridge Road, Stockton-on-Tees — the booking office for the Stockton & Darlington Railway, which ran in front of the building. The first of its two plaques reads: "The first rail of the Stockton & Darlington Railway was laid on the adjacent level crossing in May 1822". The second: "Here in 1825 the Stockton and Darlington Railway Company booked the first passenger thus marking an epoch in the history of mankind". 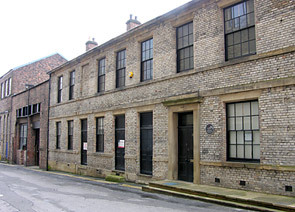 Robert Stephenson & Co. works (founded 1823) as they are today, on South Street, off Forth Street, Newcastle. The cream brick building housed the boiler plate shop and offices. This was the first purpose-built locomotve factory in the world — Locomotion, Rocket and Planet were constructed here.